The first Sunday of Great Lent, named Sunday of the Triumph of Orthodoxy, was celebrated in the Metropolitan Cathedral in Chisinau with Divine Liturgy conducted by Metropolitan Vladimir, who was assisted by numerous priests and deacons of the holy shrine. Traditionally, the entire Orthodox Church prays on this Sunday for the returning to Orthodoxy of all those who abandoned it. This Sunday was established in 843, when the decision of the 7th Oecumenical Concil (787) was reinforced, in favour of the rehabilitation of worship of God, including, in the veneration of holy icons. The event appeared as victory, of triumph of Truth over heresies and mistaken teaching about the appearing of God in the person of our Lord Jesus Christ. After the Liturgy, Metropolitan Vladimir officiated a Thanks-Giving Service specific to the Sunday of the Triumph of Orthodoxy. This Sunday comes as the first spiritual halt, or rest, on the way of Great Lent. It ends the first week of the Lent, a rather intensive in liturgical practice and prayer, a week that fully introduces Christians to the practice of fasting, drawing our attention to the spiritual aspect of this important period of preparation for the Feast of Feasts – Holy Resurrection and Pascha of our Lord Jesus Christ. The previous week was marked by very special church services, with the singing of the Great Canon of St. Andrew of Crete on the first four days of the Lent, and Divine Liturgy of St. Gregory, the Archbishop of Rome, celebrated on Wednesday and Friday. 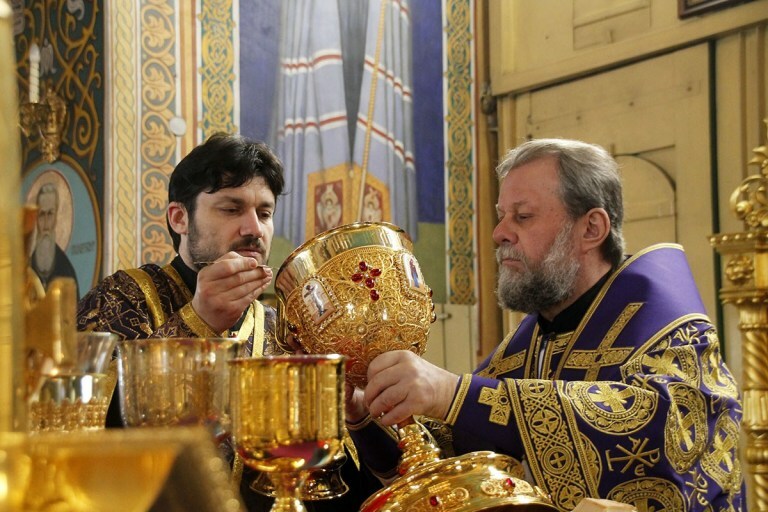 During all these days, the parishioners of the Cathedral joined Metropolitan Vladimir in prayer and spiritual contemplation, and, most importantly, in Communion. After the Divine Service on Friday, the blessing of koliva (meal of boiled and sweetened wheat) was traditionally officiated. The Saturday Divine Liturgy commemorated Holy Martyr Theodore of Tyro. These services are officiated in all Orthodox Churches across the world.